Which Stipulations Decide your Failure of Dental Implants? 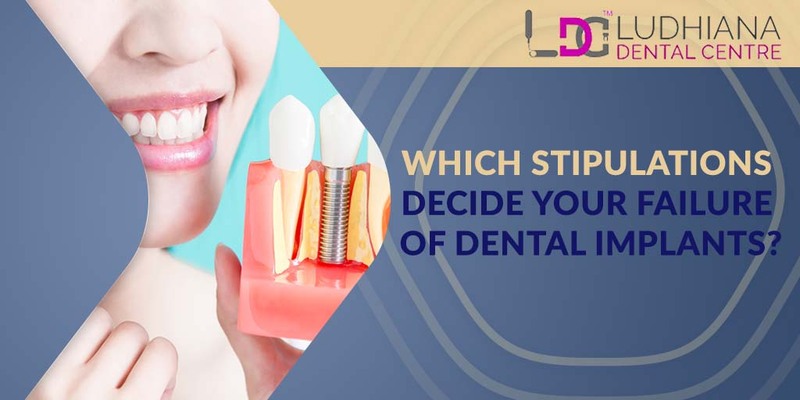 Dental implants do have a very successful history for the previous couple of decades and these are durable devices to let you feel better and work new teeth properly. It has been considered the safe procedure in dentistry. Dental implants are like artificial roots identical to screw’s shape which is embedded in patients jawbone and it gets joined with natural bone forming a concrete base for placing artificial teeth or crown, and a connector usually known as abutment is kept on implants top surface for holding crown. Crowns are customized according to patient’s mouth-shape. Poor teeth hygiene, negligence and some external factors are mainly responsible for failure of one’s teeth does not functions as intended and could lead to discomfort and further oral health complications. Patients must ensure to treat them on time before any problems arise from this. Chronic conditions such as diabetes and osteoporosis could play a role in implant failure and certain regular medicines can aggravate the situation. Failures can be categorized further into early failure and late one, if the implants got loos too early within two to three months due to improper integration of implant with the bone and long-run failure, when implant gets integrated properly but after months or years bone loss occurs around the implant. Periodontal ligament is a gel like material allows teeth to experience some degree of freedom and up to some threshold point it is considered normal but more mobility of teeth comes under gum problem. And it is not present on dental implants because they are directly positioned into jawbone and if they move means bone around it is prone to failure. When implant does not integrate with jawbone in spite of everything being done correctly? Poor blood supply adds to insufficient recovery, poor health, existing infections and sometimes tongue movement or incorrect biting during healing phase causes it to go loose. Additionally, when implants are not given adequate time to integrate and joining the teeth too early before it become able to bear burden. The positive side of it is that failures can be salvaged when caught early and proper intervention of dentistry treatments can give it a new life again. Following certain protocols in diagnosis, treating planning, surgical protocol and prosthetics can lower the risk of failures. Though the treatment is directly depends upon the cause of failure , in case any infection like peri- implantitis which may entails cleaning implant and focusing on better oral hygiene practices after procedure. In case stress on the bone around the implant is growing then a surgeon may need bone graft which comes into effect when bone loss caused an implant to fail. The onset of implant failure could be scary but early recognition can revive them again equal to healthy teeth by just up keeping the continuous precautionary measures like good oral cleanliness, brushing and flossing at least twice a day. Using alcohol-free antibacterial mouthwash can also be beneficial in preserving the implanted teeth. This is How Dental Implants Will Save Your Oral HealthHow to Combat Dental Pain Safely?